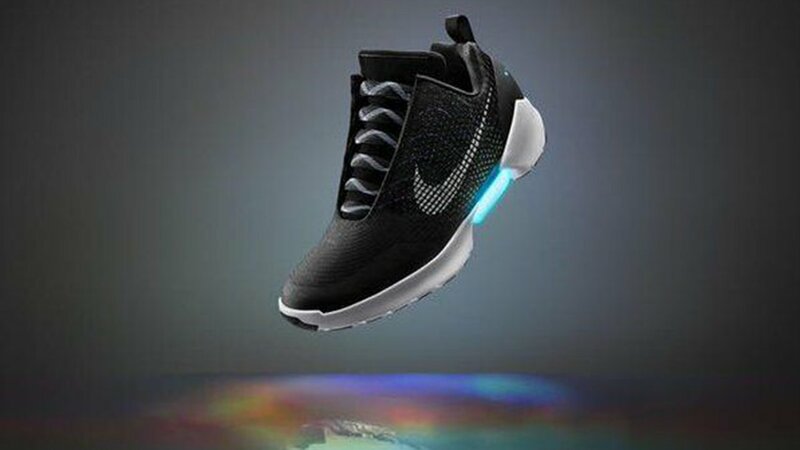 NEW YORK (WABC) -- "Back to the Future" fans can soon wear self-lacing shoes similar the ones worn by Marty McFly in the 1989 movie. Nike has unveiled the first adaptive lacing shoe - HyperAdapt 1.0. "When you step in, your heel will hit a sensor and the system will automatically tighten," explains Tiffany Beers, Senior Innovator, NIKE, Inc., and the project's technical lead. "Then there are two buttons on the side to tighten and loosen. You can adjust it until it's perfect." Beers began pondering the mechanics shortly after meeting Nike designer Tinker Hatfield, who dreamed of making adaptive lacing a reality. He asked if she wanted to figure it out - not a replication of a preexisting idea but as "the first baby step to get to a more sophisticated place." The project caught the attention of a third collaborator, NIKE, Inc. President and CEO Mark Parker, who helped guide the design. The process saw Beers brainstorming with a group of engineers intent on testing her theories. They first came up with a snowboard boot featuring an external generator. While far from the ideal, it was the first of a series of strides toward Beers and Hatfield's original goal: to embed the technical components into such a small space that the design moves with the body and absorbs the same force the athlete is facing. Through 2013, Hatfield and Beers spearheaded a number of new systems, a pool of prototypes and several trials, arriving at an underfoot-lacing mechanism. In April 2015, Beers was tasked with making a self-lacing Nike Mag to celebrate the icon's true fictional release date of October 21. The final product quietly debuted Nike's new adaptive technology. In the film, McFly, played by Michael J. Fox, travels 30 years into the future to today's date: Oct. 21, 2015. There, he discovers hoverboards, flying card and self-lacing sneakers. Fox got to try on the shoes in real life that day. Self-tying shoes, or adaptive lacing, offer tremendous potential for athletes, Hatfield adds, as they would provide tailored-to-the-moment custom fit. "It is amazing to consider a shoe that senses what the body needs in real-time. That eliminates a multitude of distractions, including mental attrition, and thus truly benefits performance," Hatfield said. Undue pressure caused by tight tying and slippage resulting from loose laces could become relics of the past. Precise, consistent, personalized lockdown can now be manually adjusted on the fly. "That's an important step, because feet undergo an incredible amount of stress during competition," he says. The Nike HyperAdapt 1.0 will be available ONLY to members of Nike+ beginning Holiday 2016 in three colors. To become a Nike+ member and sign up for notifications about the Nike HyperAdapt 1.0, go to Nike.com.